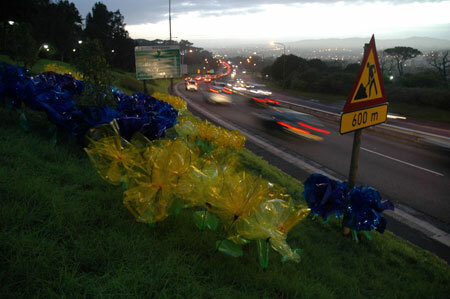 If you were driving to work last Friday in Cape Town, you likely saw something along the side of the highway that didn't look quite right; patches of blue and yellow cellophane flowers and tiny little windmills. No, Disney didn't invade Cape Town with It's A Small World but Can You Twist, South Africa's first online reality show which transitions episodes offline with real life, ARG-style endings. Some of the real life endings include flowers handed out to 250 women around the country and a bank "break up letter" newspaper ad in which underlined words spelled out the site's URL. Wouldn't it be nice if you really coculd break up with your bank and leave all your debt behind? Now that would truly be a great reality show. Do you know what the web address is?